Knowing how a customer finds you can be just as significant to your business as the invoice they pay. If you know where they came from (Yellow Pages, radio and print ads, a referral from another customer), you know how your outreach efforts are doing. Knowledge is power. You've always been able to store this information yourself in Kickserv. Just edit the contact and scroll down to the Additional Contact Information section. Wouldn't it be great, though, if the customer could answer that for you? Now, they can. 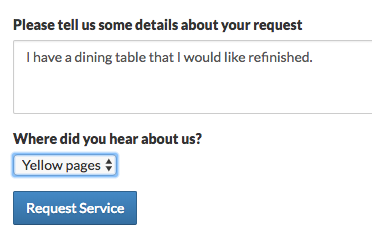 It's right on your Contact Form. Do you have some customer sources that are for internal use only? Odds are you don't want your customer to be confused by seeing "Spring Ad Campaign #146" on the contact form. So we gave you the option to either show the source on the form or not. Go to Settings > Customer Sources and click the Edit button next to a source. You'll see an option called "Show this source on the Contact Form". Check or uncheck it. It's totally up to you. Tip: If you don't mark any sources as public, the option will not be shown on the Contact Form, and all customers who fill out the form will be set to "Other". You can always change the customer source later if you want.